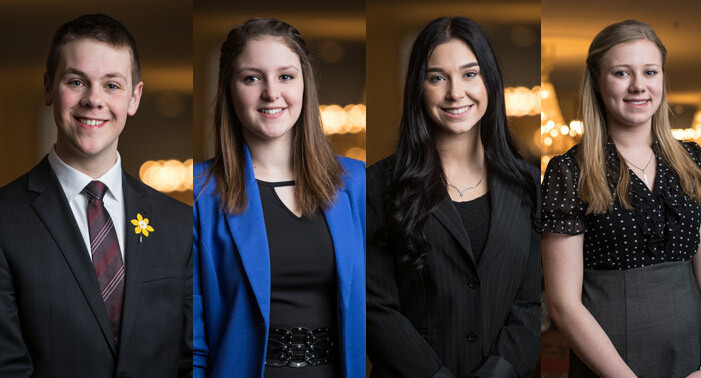 Four Atlantic Canadian high school students are winners of the prestigious Currie Scholarships at the University of New Brunswick, saluting their dedication to the community, leadership skills and academic performance in their high schools. The Currie Scholarships were established by Dr. Richard J. Currie, UNB Chancellor Emeritus and one of Canada’s most accomplished business leaders and philanthropists. This year’s Currie Scholarship recipients are Colin Brown of Grand Bay-Westfield, N.B. ; Madelyn Doucette of St. Louis, P.E.I. ; Morgan Meade of Mount Moriah, N.L. ; and Tayler Milbury of Bear River, N.S. Colin Brown will graduate from Harbour View High School in Saint John, where he is president of the school’s student representative council and was awarded the Student Leadership Award of Distinction each of the past three years. He is a member of five varsity sports teams, a national panelist on community development with Motivate Canada and has earned the Teens Who Care Award, the Fundy Wellness Champion Award and the Cultural Diversity Youth Leader Award. He will pursue his bachelor of engineering degree at UNB with a goal of becoming a leader in nuclear technology. Madelyn Doucette will graduate from Westisle Composite High School, where she has developed a keen interest in engineering and hopes to work in the biomedical engineering field. At Westisle, she was a member of several leadership committees and took part in a six-month student exchange with a school in Gaspé Bay, Que. She’s worked at Camp Triumph counselling children and youth whose families are affected by chronic illness or disability, writes a school column in three newspapers and played on the varsity basketball team. Madelyn will study in UNB’s bachelor of engineering program. Morgan Meade will graduate from Corner Brook Regional High School, where she is president of the student council and is heavily involved as a volunteer, notably through a chapter of Jack.org, which promotes mental wellness for youth. She also raises funds for many organizations, including the Canadian Cancer Society and Interact, a global fundraiser that will help children attend school in Gambia. Morgan has participated in the Shad Valley program, attended both the Canadian Student Leadership conference and the Canada 150&Me Youth Forum on the Environment. She will begin her bachelor of business administration degree in September and is looking toward a career in law. Tayler Milbury will graduate from Annapolis West Education Centre in Annapolis Royal, N.S., where she serves on various student council committees, took part in a science venture called the Annapolis Royal Space Agency and earned the Lieutenant Governor’s Education Medal. She has participated in the Royal Canadian Legion Nova Scotia’s Leadership Training Camp, Encounters with Canada and has completed the bronze level of the Duke of Edinburgh Award. Additionally, she has volunteered in many areas of her community, ranging from service in the youth zone of her local YMCA to fundraisers for Tim Hortons Camp Day and a local dinner theatre. She is enrolled in UNB’s bachelor of science program and hopes to become a doctor. For more than 10 years, the Currie Scholarships, now valued at $65,000 each, have been awarded to students beginning a degree program at UNB upon graduation from a high school in any of the four Atlantic provinces. These scholarships are intended to support the education of future leaders. Dr. Currie started university at UNB as a Beaverbrook Scholar and ended with an MBA from Harvard. He served as UNB Chancellor from 2003 to 2013 and in May, 2014 was named Chancellor Emeritus. Dr. Currie played a fundamental role in the development, design and financing of the state-of-the-art Richard J. CURRIE CENTER on UNB's Fredericton campus. He is an Officer of the Order of Canada and a Companion of the Canadian Business Hall of Fame. Photo: Colin Brown, Madelyn Doucette, Morgan Meade and Tayler Milbury. Individual photos available upon request.